Almaty, the former capital and Kazakhstan's largest city, inaugurated the first line of its metro system in December 2011. There are seven stations along the 8.5 km line. Tashkent is the only other Central Asian city that boasts a metro. Construction first began in 1988, however, the collapse of the USSR meant that funding was no longer available for this massive project and it was suspended. In 2003 the Kazakh government announced funding for its continuation. Five more stations are being built on Line 1 and a second line is planned. 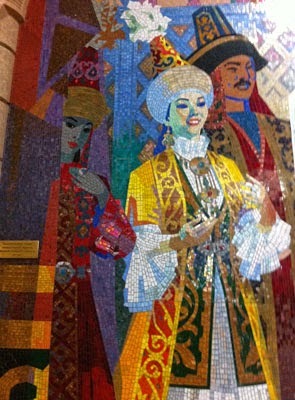 It is a pleasure to ride: the stations and carriages are air-conditioned, richly decorated in mosaics and traditional Kazakh designs. The network is spotless and there is no graffiti. Trains run every 10 - 15 minutes from 6:00 a.m. to midnight. You can purchase 90-day multi-entry smart cards or a single "jeton"(жетон) is 80 tenge, around 50 cents, from the ticket booth (касса). Services are available for wheel-chair bound passengers and those with special needs. ATM machines that accept foreign credit cards for cash withdrawals, are available at all stations as are machines to top up mobile phone cards. Signage and announcements are in Kazakh and Russian only so please ensure you can read your destination in Cyrillic. Photography is permitted. Taking a lead from the Moscow and Tashkent metros, the Kazkah decorations are splendid. Each station's floors and walls are richly decorated in granite or marble, patterned in traditional designs. The lighting is lavish. Even the inside doors of the carriages are embossed in Kazakh patterns. Each station has a theme, which is reflected in its decoration. 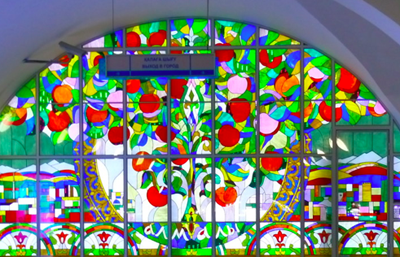 Almaly (Алмалы) station features a huge and glorious stained glass image of an apple tree. In Soviet times, Almaty was known as Alma Ata, which means "Father of Apples" as the original apple is believed to have originated there. On independence its name was changed formally to the Kazakh version - Almaty. Baikonur (Байконур) station is named after the world's first and largest space launch facility, which is located in the Kazakh steppe. (Many historic space flights were launched from here, including Yuri Gagarin's first manned, orbital flight in 1961). Baikonur station is high tech with crisp blue and white panels; films of rocket launches are screened. 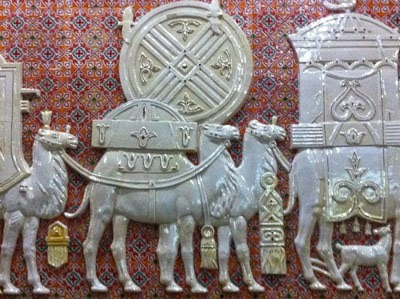 Zhibek Zholy (Жибек Жолы) station, meaning Silk Road, displays gorgeous ceramic works celebrating the famous trade routes. Terminus station Raiymbek batyr (Райымбек батыра) celebrates the 18th century Kazakh warrior. If you are visiting Almaty, consider spending an hour simply roaming the network enjoying the visual treats. And certainly use it as a means of getting around to points of interest. (The bus and tram networks are also new and efficient in the city). Almaty is rightly proud of its metro - a magnificent example of how beauty can be incorporated into new, public infrastructure.